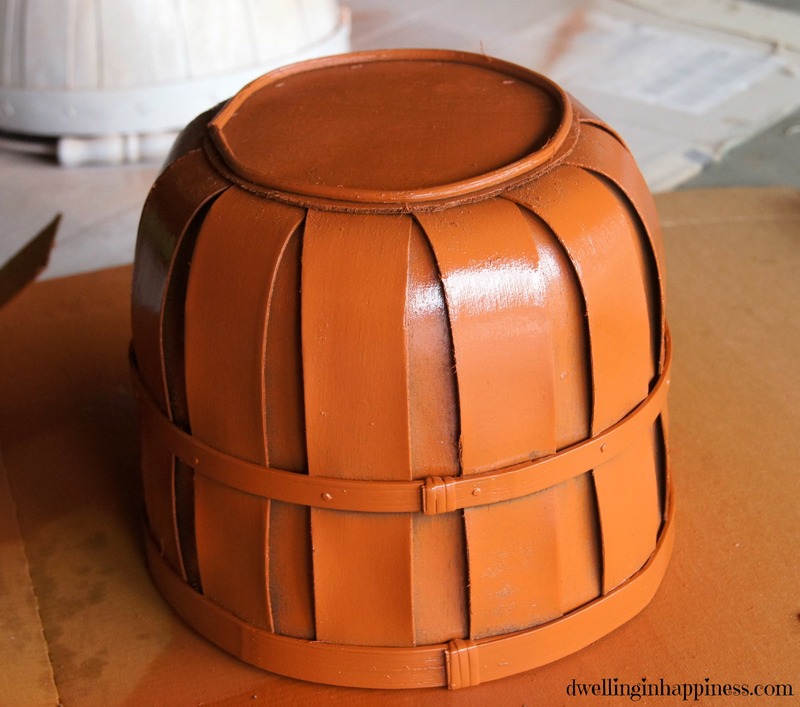 Easy DIY Fall Decor: Basket Pumpkins! Hi, friends! 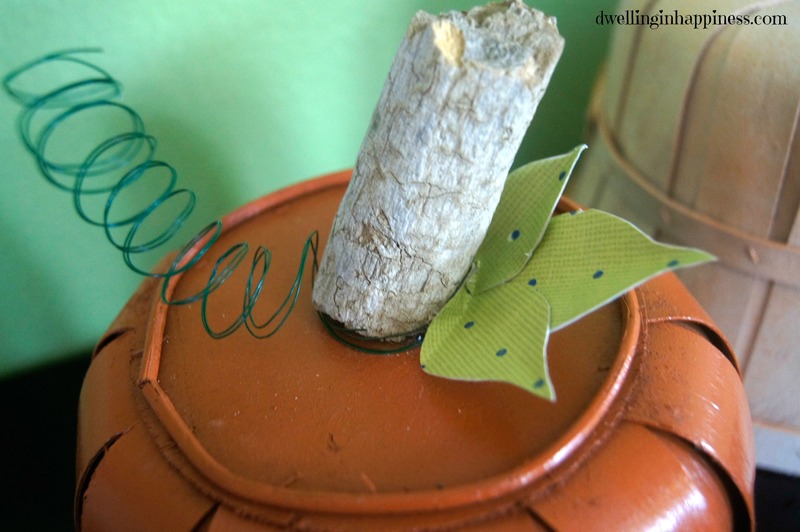 Time for another super easy fall craft. 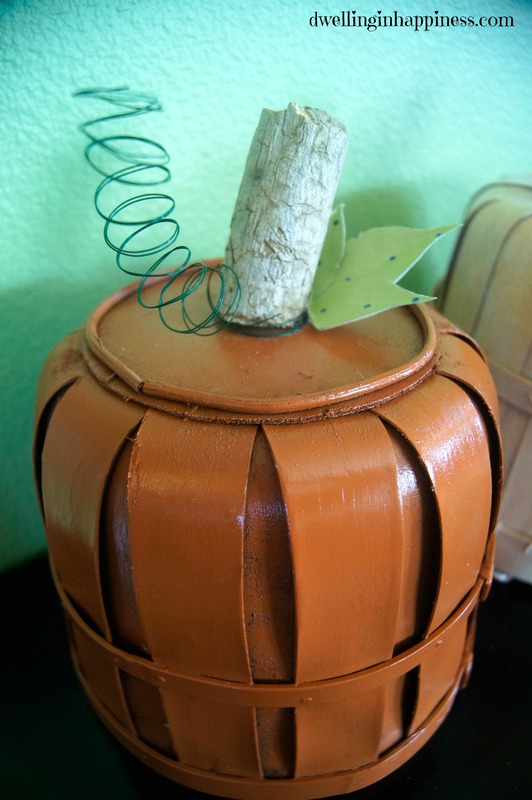 I had this cute basket that I wanted to do something with, but didn’t know what. I was thinking of using it for some fall flowers, but I just wasn’t sold on the idea. 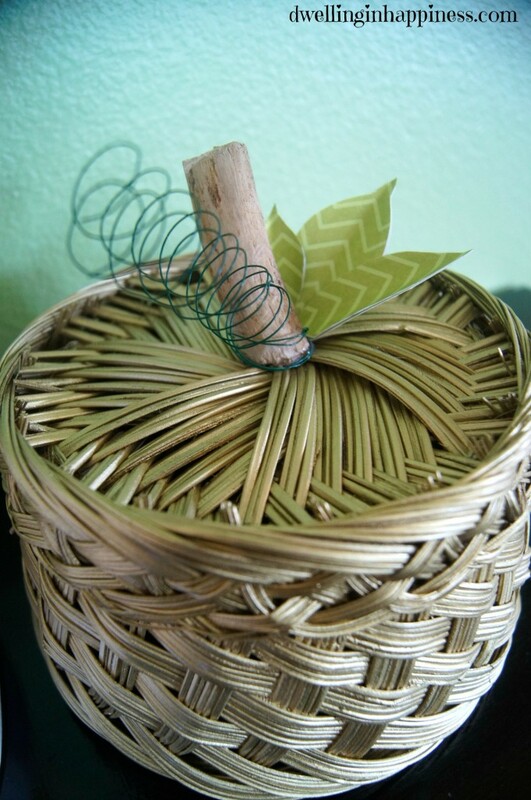 I was studying the basket and turned it upside down thinking I could use it as a stand and thought, “hmm, if I added a little wooden stem and a leaf on top, it looks like a pumpkin!” And so, my basket pumpkins were born. I grabbed one of my best friends (spray paint!) and visited the other (Goodwill!) and found two more baskets, and the magic began. You’ll start by spray painting your pumpkins. I had planned to do a gold, orange, and an almond colored pumpkin, but my brand new almond spray paint decided to not work, so I improvised. I painted it white instead, and the orange spray paint I used for the one above was just about out so I spritzed the paint from far away so it left just a super light splattering of orange over the white. I love it when you have no clue what you’re doing and it turns out cute anyway! While those dry, find 3 branches and cut as needed. 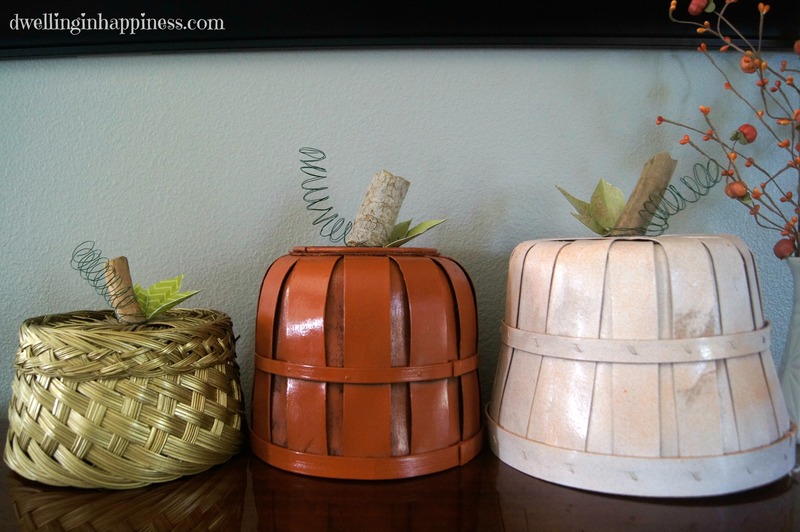 I just hot glued them on top of each basket. Take your green paper, then draw and cut out 3 leaves in the shape you want. If your paper was only one sided like mine, I folded the paper in half and drew the leaf from the crease so that when I cut it out, I had two leaves connected that I could just fold in half. I taped them together. Fold each leaf in half to give it a crease, and then tape 3 leaves together overlapping just a bit to create one larger looking leaf. I hot glued them right up to the pumpkin stem. 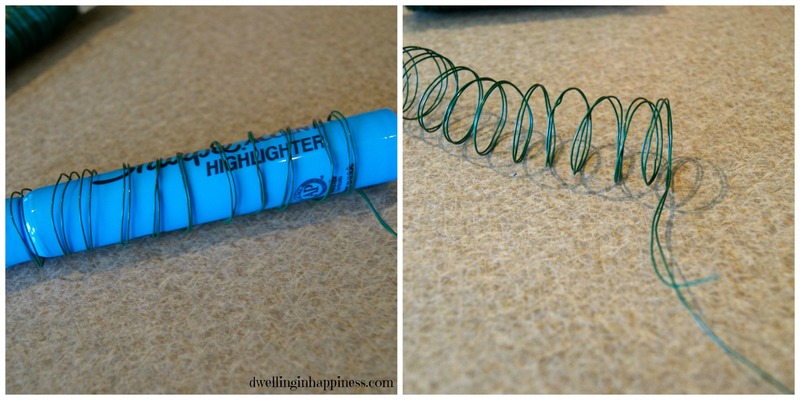 Then take your green floral wire to make the coils. I had to double up my wire because it was so thin. I used a highlighter to wrap it around because I wanted a looser coil, but you could also just use your finger. Leave a few inches of wire straight at the end. After carefully removing the coiled wire from the pen, use the extra few inches to wrap around the base of the wooden stem. Finished! 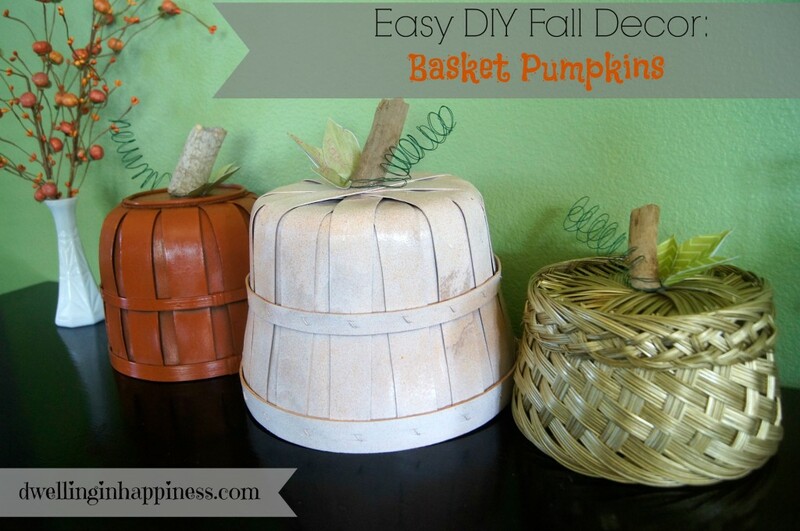 Now display these baskets posing as cute little pumpkins somewhere nice! I love the real wood stem, it really gives it some character! I really like how you can see very subtle orange splatterings on this one! I still have more fall decorating to do, but I’m well on my way! Stay tuned for my command center reveal coming soon! What a neat idea, Amanda! Love them! And those twirly little stems 🙂 So cute! Have a great day, friend! Oh my goodness! So adorable! You crafty little genius you! Thank you friend! Ha, crafty genius! 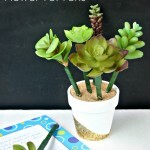 You are most definitely a crafty genius yourself! 🙂 Happy Wednesday! SUCH a creative idea! I just love the little stems!!! These are so fun, Amanda! 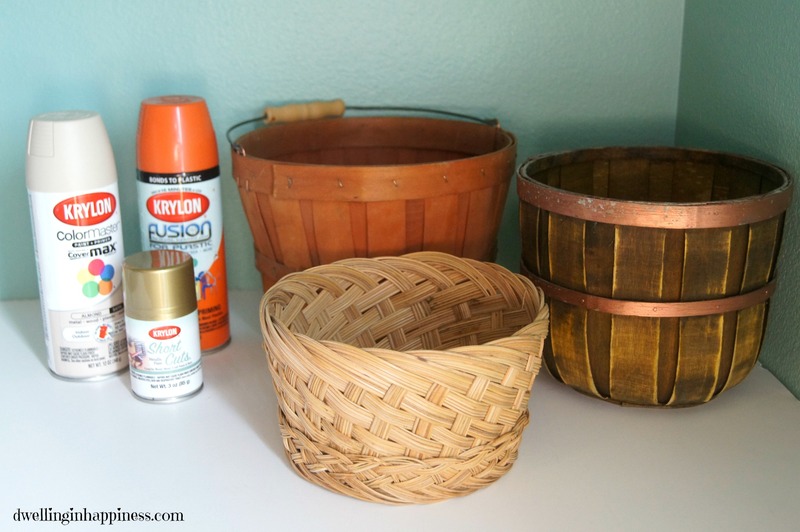 I never would have thought to use baskets this way – so unexpected! Pinning! This is very creative and outside the box which I love! Your pumpkins are one of a kind! Pinned! Who would have thought! What a great idea, Amanda, they are so cute! I absolutely LOVE this. 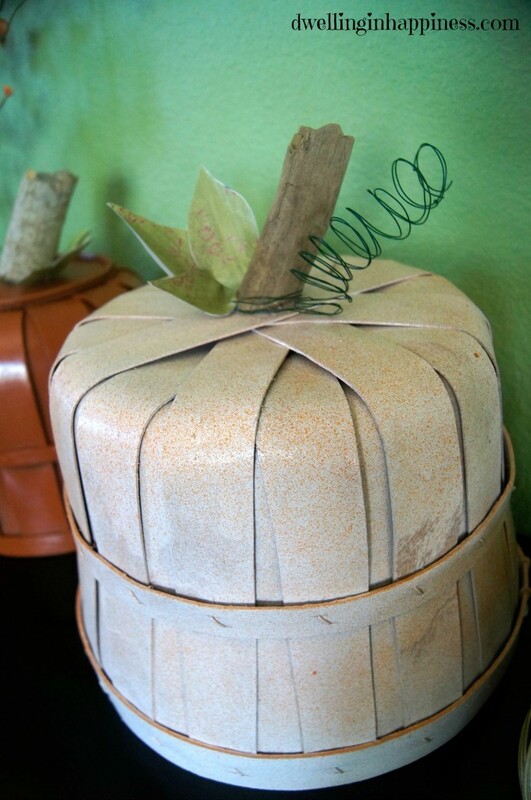 What a great way to use baskets…so not typical. I hope you can share these on Merry Monday tomorrow at 6pm PST. Pinned. This is such a great idea! 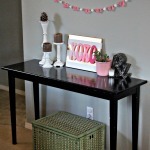 Thanks so much for linking up to YDTT! Pinned! Thanks so much, Katie! 🙂 Have a wonderful week! These are adorable, such a creative idea!! I just love fall!! Thank you, Diana! I love fall, too! I’m finally getting in the mood, now that I’m mostly decorated and it’s finally cooling down! Hope you’re having a great week! Stopping by from the Ducks in a Row link up! Thanks, Joanna! Ha, they were totally easy to make, even the non “super crafty” can make them!! 🙂 Thanks for stopping by, have a great week! What a cute idea. I am sure everyone has a couple of those types of baskets laying around. 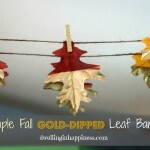 Great fall project! This is a really creative idea. It turned out so cute! I should try this sometime. OMG those are AMAZING! I am so mad that I didnt think of that lol. I have so many of these kinds of baskets laying around my shop doing nothing but collecting dust..time to get to work lol. Thanks for linking this up!! These are amazing! I have a huge basket that had a ton of apples in it. We are almost empty and I am going to be doing this exact thing to it. This is so creative! Thanks Emily! Yay, I’d love to see a picture of the finished product!! I’m so glad you’ll have another purpose for your basket! 🙂 Have a great weekend! 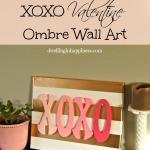 Awesome project – this is so creative I’m thinking they would look cute on a front porch. Thank you, Carole! You’re right, these would be perfect on a front porch! 🙂 Thanks for stopping bye! Thank you so much, Marie! They were so fun to make!